NWCS is short for Northwest Cannabis Solutions – just wanted to get that out of the way. This week we’ve got a straight sativa (or crooked sativa, whichever way you swing) from the producer mentioned in the prior sentence. Their products can be found at many Seattle area pot shops (specific stores mentioned in the last paragraph of the review) in the area of $30 – $40 for 3.5 grams, depending on various happy hour discounts, etc. The strain is Haze and, if you didn’t catch on already, this iteration is produced by Northwest Cannabis Solutions. According to the website, they are one of the largest marijuana producer/processors in Washington (size does matter). Sporting a “state of the art growing facility, a cutting edge extraction lab, and a world class edibles kitchen” NWCS clearly has an outfit rivaling NASA (if I’m reading their “about” section correctly). When you go to their website, there is a video to watch. It’s called “Clone to Smoke” and showcases the journey of a humble weed plant to the potent herb we smoke. There are a bunch of glossy shots of plants being tended, soil being silted, and nugs being meticulously trimmed – then they pop it in a grinder, roll up a joint and smoke it. All and all, it made me want to smoke some weed. Lucky I had this Haze. Feeling like a noob, I had never even heard of simply “haze” before. Sure, I’d heard of “purple haze” and “silver haze” – but this was a new one for me (fun fact: according to Seedfinder there are over 300 variants of Haze strains). Haze looks like you would imagine good weed looking like. 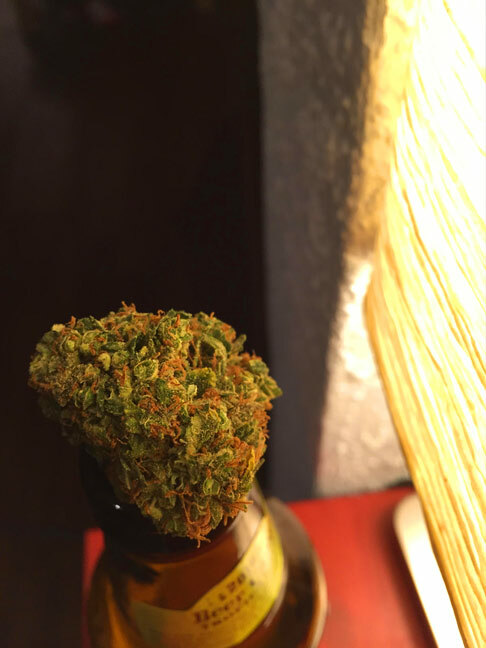 A large nug perched a top my beer bottle, the red hairs really stand out amongst the varied shades of green. There is a kief dusting as well, giving the buds a sparkly demeanor. Cracking open the package, the strain has an earthy smell; giving wafts of dirt, and grass. After grinding it up, there was a definite bubblegum aroma on top. The flavor was similar, tasting of berry and hay – with a notable skunkiness. The high you get from Haze is subtle, yet fulfilling. 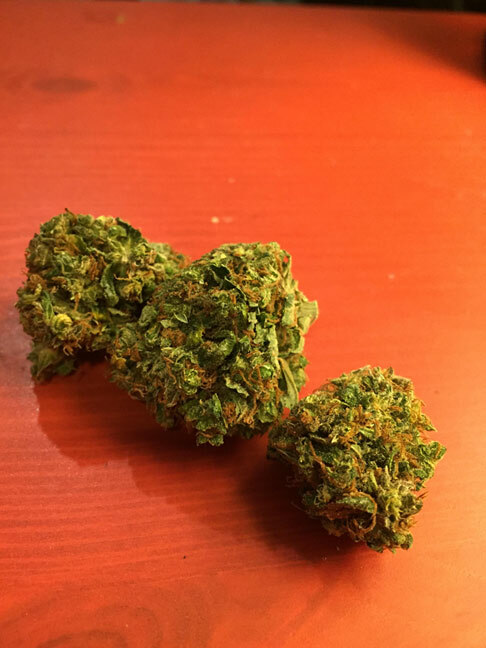 A euphoric combination of creativity and social positivity makes this strain favorable for morning and daytime usage. Rejoice in a clear-headed high that doesn’t make you tired. After smoking Haze, it feels like I have a protective buffer from the world. Guarding me from normal irritations and occurrences, guiding me towards a functional and productive mindset. This is a useful “do stuff” strain, a base high for all the other high’s. 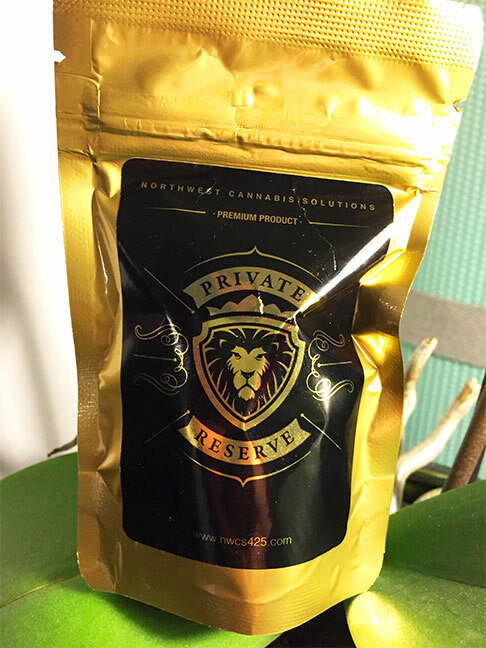 Northwest Cannabis Solutions products can be purchased at Seattle area recreational shops like Capital Hill’s Unkle Ike’s, Fremont’s Hashtag, and Bellevue’s BelMar.